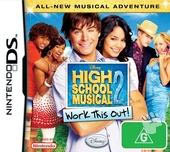 Another Disney phenomena blasts its way onto the Nintendo DS that is based on the hit TV series called "High School Musical" which revolves around a high school with larger than life characters who sing and dance their way through the stories. Definitely aimed for the teenager, High School Musical 2: Work This Out is based on the second movie of the series and revolves around the East High Wildcats as they are spend their summer at the Lara Springs Report. Listen to the songs even when the Nintendo DS is closed! The gang from the East High Wildcats are working as waitresses, lifeguards and even caddies but still remain good friends during this working holiday. This adventure game has taken quite a few liberties from the movies, however fans should have no problems in identifying all the characters and scenarios which are littered throughout the gaming world. 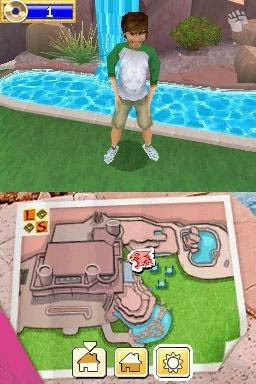 The title also contains some interesting mini-games as you search the gaming environment for a variety of items in order to solve the mysteries at hand. In its basic essence, the game is reminiscent of those classic adventure games, however it makes good use of the Nintendo DS interface that adds a few twists and turns into the gameplay. Of course as the series is based on the music, so are some of the tasks that the players must do as they attempt to match their rhythm with the games rhythm which does get progressively more difficult as your continue upon your adventures. Whether you're making sandwiches or playing golf, the games in High School Musical 2 Work This Out are aimed at the younger gamer so one should keep this in mind when considering to purchase this title. Graphically, the title is reminiscent of the series with larger than life characters and some nicely detailed gaming environments that go hand in hand with the gameplay of the title. 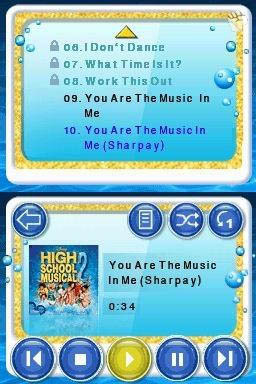 The musical score of High School Musical 2 Work This Out does get a little repetitive, however it does contain some of the songs from the original movies which fans will simply adore. The sound effects are quite impressive as is the jukebox which allows you to change the songs that you are hearing. 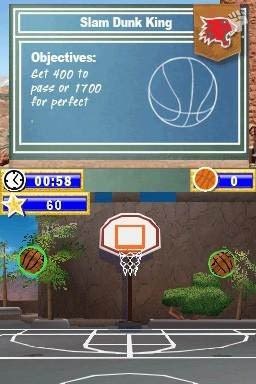 In conclusion, High School Musical 2: Work This Out is a great game for the younger game which is extremely kid friendly and does target the High School Musical Fan which some interesting and entertaining (some boring) mini-games with a great storyline and some great Nintendo DS graphics and sound. Check it out!